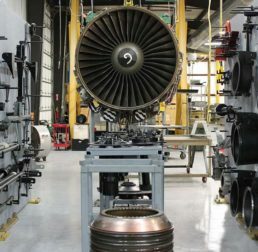 BP Aero is recognized as an industry leader in engine part repair and overhaul. We differentiate ourselves with quick turn time, excellent customer service and custom solutions. Engine part repair and overhaul is a service that demands rapid response, innovative solutions and accurate communication. The BP Aero team values the trust our customers grant us and we strive every day to enhance their experience with each order we process. We have over 16,000 part numbers on our FAA/EASA capabilities list and over 12,000 on our CAAC capabilities list. We are FAA, EASA, CAAC and ISO 9001:2008 certificated. We hold license agreement with GE, CFMI and P&W granting us access to engine service manuals, spare part and technical support. These engine models include CFM56-3, CFM56-5A, CFM56-5B, CFM56-5C, CFM56-7B, CF34-8, CF6-50, CF6-80C2, GE90-94, V2500-A1, V2500-A5, and PW4000. For airframe, we also include Boeing 737 QEC and Boeing 747 QEC. We overhaul cases, housings, seals, supports, shafts, LPT disks, booster spools, 4-9 spools, A/O Separators, CVT’s, AGB and TGB parts along with a wide variety of tubes, manifolds and brackets. Typical repairs include dimensional restoration using thermal spray, welding of cracks and defects, welding of replacement sections and details, composite repairs, painting, metal surface lapping, pressure testing, FPI, MPI and CMM inspection. Our special processes include plasma spray, high velocity oxygen fuel (HVOF), flame spray, tungsten inert gas (Tig) welding, vacuum heat treatment, high pressure water jet stripping, dynamic balancing, lapping and grinding of tight tolerances. Our non-destructive test (NDT) capabilities include florescent penetrant inspection (FPI), magnetic particle inspection (MPI), coordinate measuring machine (CMM) inspection and pressure testing. BP Aero benefits from having engine teardown capabilities within our portfolio. Often, form, fit and function issues arise in engine part overhaul and by reviewing an engine in teardown, we prevent issues from occurring by increasing our understanding of how the part functions in the engine. We also offer discounts for any engine overhaul parts coming directly from engine teardown. We offer part storage to aid our European and Asian customers looking for a North American solution. These unique strengths help differentiate us from our competitors.